Stock markets have been spooked by talk of a trade war between the US and China. The consensus view is that trade wars and tariffs are bad for economic growth and the stock market. It’s not hard to see why experts think so. If US companies have their supply chains disrupted, they have to find alternatives to buying raw materials and goods from China. These alternatives are likely to be more expensive. If companies can not pass on the increased cost to the customer, then their profit margins are likely to shrink, which may negatively affect their stock prices. If China retaliates with tariffs on US exports, US companies may become more expensive and less competitive in large markets that they currently sell to. This would have the the effect of reducing the revenue these companies generate from sales and cutting into their profits, negatively impacting their stock prices. In this post we study the stock market in 1929 to see how US stocks responded to the passing of the Smoot-Hawley tariffs. The Smoot–Hawley tariffs were an act implementing protectionist ideas that was signed into law on June 17, 1930. The act raised tariffs on over 20,000 imported goods. Other countries responded by retaliating by imposing tariffs on US exports. The chart below shows the Dow Jones industrial index from 1929 to 1931 and shows key events around the passing of the Smoot-Hawley Tariffs. The Smoot-Hawley bill passed in the house on May 28, 1929 and the senate on March 24, 1930. Short term stock market reactions to both events were relatively mute. By the time the senate had passed the bill, the stock market crash of October 1929 had occurred and the idea of protecting US manufacturers from foreign imports had become more politically pressing. 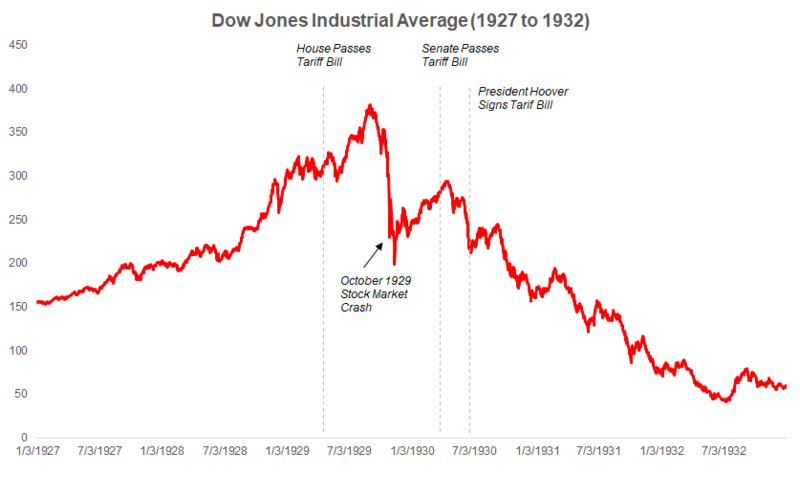 However, by the time president Herbert Hoover actually signed the tariffs into law on on June 17, 1930 the Dow Jones had dropped over 16% from its 60 day high in anticipation. However, this 16% short term price drop was a precursor to a much larger bearish market. After the tariffs passed US trading partners such as Canada and the Europeans retaliated; eventually leading to lower levels of trade between the US and its trading partners. To illustrate, trade between the US and Europe shrunk by over two thirds over the next 2 years. The stock market’s return over the next few years were dismal; the Dow returned -33% over the next 1 year and -81% over the next 2 years. But were these negative returns solely driven by tariffs? By the time the Smoot-Hawley tariffs were passed into law the stock market crash of 1929 had already occured. There are many reasons for the crash, many of which are outlined in our ultimate guide on the 1929 stock market crash. The Smoot-Hawley tariffs were implemented in an environment where banks were allowed to go out of business and monetary policy was too tight due to second order effects of being on the gold standard. These factors also contributed to a massive contraction in the economy, resulting in spiking unemployment and collapsing demand for goods and services. So while the tariffs may not have been the sole cause of terrible stock market performance, they certainly didn’t help. So what is a risk-averse investor supposed to do? It makes sense to always be invested in the market and not try to buy or sell based on predictions of when the market is going to go up or down. However, that is likely little comfort to an saver who doesn’t want to lose any of their hard-earned money. An alternative is to buy a certificate of deposit (CD) and receive a guaranteed rate of return, but interest rates in those products are still not particularly compelling. If you are worried about the market going down, there are strategies that allow you to get some market upside while protecting yourself from losing any money. You can implement these strategies on your own using a combination of bonds and options or you can sign up for early access to Benjamin, which handles the complexity for you but with the added benefit of tax deferral. For more information on how to do it yourself in 3 easy steps see our guide to participating in some market upside with no downside..